the dish sure is big enough! When I first went to Big Dish in Thornbury, purely on the basis that it seemed to have semi-decent reviews on Urbanspoon and was tucked away out my way, Tristan was adamant it not be reviewed due to the possible flux of hipsters. I politely pointed out that a. he was a dirty, filthy, stinking hipster and b. I really, really, really liked it. The second time we went, we’re in the car going back to mine. Big Dish is always packed. It’s also a house, or rather, was. I overheard the cook telling a couple to grab seats in the kids’ room if nowhere else was available. On our first visit, we sat at the communal table, which really is just a dining table. The last time we went, we got a table outdoors. I couldn’t remember when it was last warm enough to sit outside! Yea spring. The menus are adorable and are repurposed Little Golden Books. Remember those? The only one I have is for the ‘Twelve Days of Christmas’, bought for me when we lived in England to help with a maths competition (I didn’t win. It’s okay, one year there I won a soft toy tiger that I originally named ‘Tigger’. He made the Britain-to-Australasia trip too). Tristan read the one below while I went back inside to order. The only real issue with the menu is a lot of it is egg-based. Don’t get me wrong, I love eggs for breakfast, but if you’re trying to avoid them then options are tricky. Having said that, I ordered the campfire breakfast – cherry tomatoes, mushrooms, bacon, caramelised onions, scrambled eggs and spinach. It’s baked in a small cast-iron pan and served with a side of sourdough. Divine. Tristan had the claypot eggs which comes in three flavours: chorizo, spinach and fetta or basil and parmesan. He chose the spinach and fetta. The eggs are cooked in a tomato and sweet capsicum salsa. 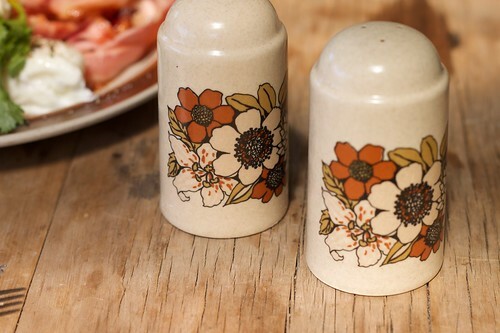 Sourdough is perfect with this for soaking up the leftover juices. Again, a deeply impressive dish. It’s no fluke. My chilli con carne burrito was freaking fantastic. Wine-marinated mince and everything! And the stringy cheese and beans! I ate everything, even the guacamole, Jalapenos and tomato relish. Damn good tortillas too. I haven’t had breakfast as I write this and could really go this again. Care to peek inside? T was equally thrilled with his sweet corn hot cakes that comes with perfectly poached eggs, avocado, horseradish cream and your choice of a side of bacon or smoked salmon. Their chai lattes aren’t the best I’ve had, but T tells me the coffee is really good. It turns out that they use Coffee Supreme beans. 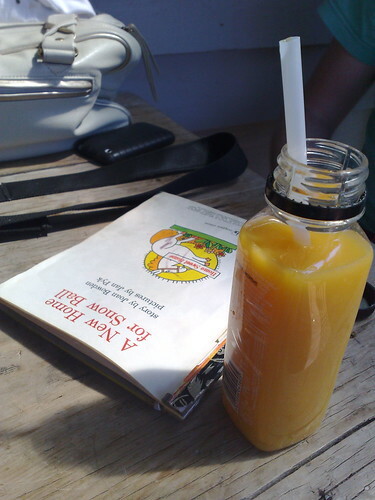 I love the Mexican lilt to their menu and the warm, friendly service. Expect to pay about $15 or so for a breakfasty-brunchy treat. While you’re at it, have a browse through the art for sale displayed on the walls. Yea for supporting local artists. 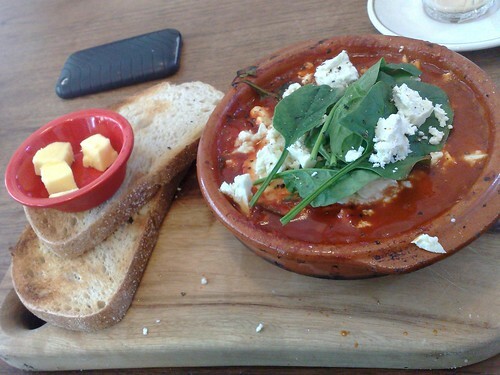 This entry was posted in eatie-foodies dining out and tagged Big Dish, breakfast, brunch, Melbourne, Thornbury on October 5, 2010 by gem. I’ve mentioned before that out my way (northern greater Melbourne), there isn’t really much in the way of snappy breakfast places, but discovered another place not too far from my end of town, right at the termination of the 112 tram’s route. The little eatery is called Jackson Dodds and it’s on Gilbert Rd. Again, actual suburb is contentious – I’ve seen some say it’s in Thornbury, some say it’s in ‘Rezzo’ (Bogania for Reservoir, I believe). I’m personally inclined to place it in West Preston because that’s where the tram route says it finishes. 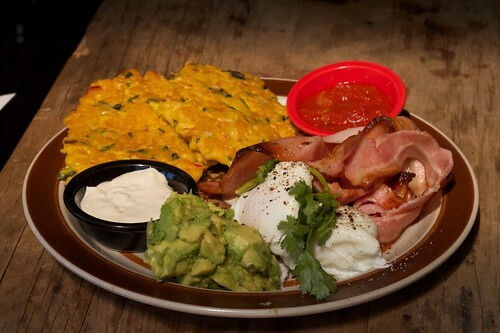 Location aside, it has fantastic breakfast and brunch options. The first time I went there, I chose to have kedgeree. There was no room in my belly for the toast provided. The rice was topped with mango chutney, and had smoked rainbow trout as well as a quartered boiled egg. I would have liked the rice to be a little spicier. But goodness, it was so good. 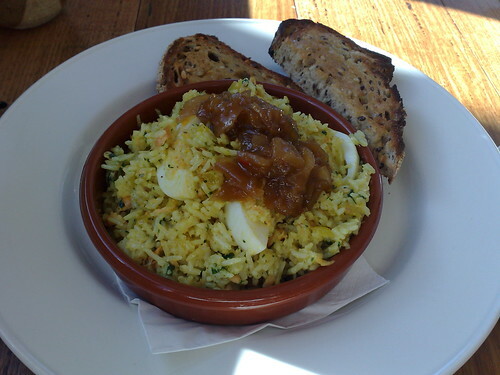 I have never seen kedgeree on a menu anywhere so was quite excited to see, and try. The chutney is a little sweeter than I’m used to (the chutney my father has is usually more sour rather than sweet) but it’s probably suited to a more Western palate. 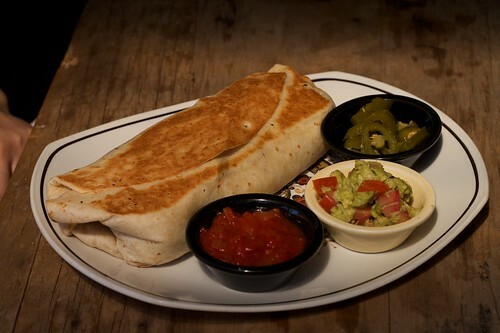 Mmm, just thinking about this dish has my mouth watering. You need to try this. 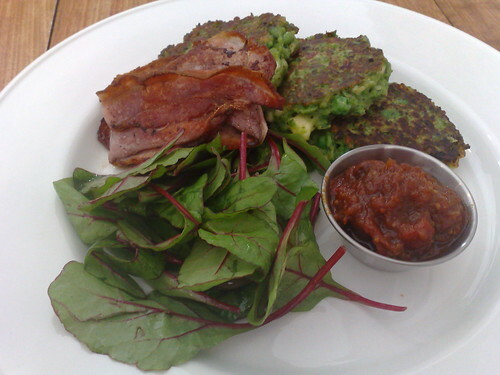 The next time I went, with someone in tow, I agonised over the gorgeous menu options, but decided upon the pea and haloumi fritters, with tomato chutney and beetroot leaves. This is probably one of the most exciting brunch dishes I’ve had in a very long time. I couldn’t actually taste the haloumi, but totally didn’t mind – the peas were just out of this world. Imagine sweet, fluffy fritters. The chutney was sweet and had a little bit of chilli for kick. Personally, I love beetroot leaves as I find them really flavoursome. And then a side of bacon! Truly, this dish could do no wrong. I couldn’t stop thinking about it all day. It looks gorgeous too. 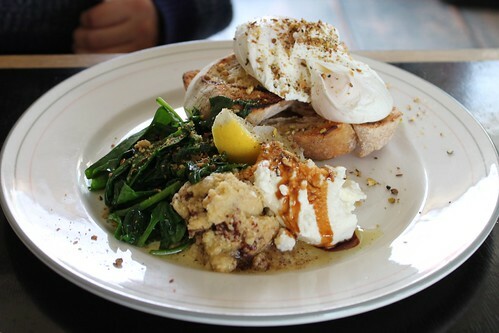 Equally impressive I’m told, was the dukkah eggs. They smelt delicious and wonderfully fragrant with Middle Eastern spices. I love the way the poached eggs appear encrusted in sesame and various spices. Partner said they were similar to the ‘lean green’ eggs dish at nearby Pearl Oyster, but even better. 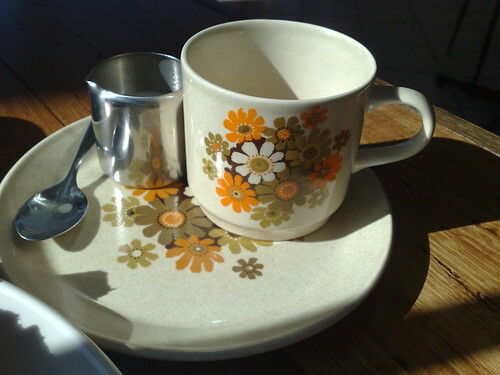 I also have a really soft spot for the crockery used for tea. It’s like they chose the best stuff of its kind available at the op-shop, or Savers. This place is unbelievable value for money – nothing is over $15 and the food is just phenomenal for the price. There are so many other things on the menu that I’m dying to try. It’s sometimes a little hard to get the attention of the staff and it understandably gets very busy. Even if you live closer to the city, it’s so worth the trip! So, when are we going? I am itching for a reason to return, and show it off to friends. 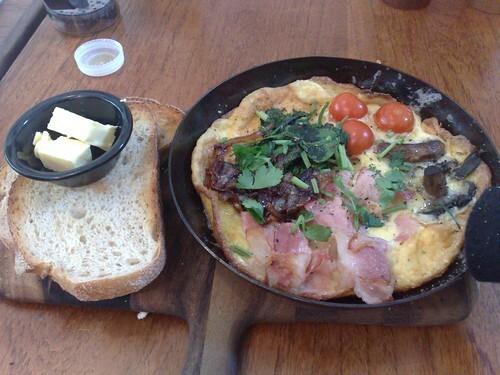 This entry was posted in eatie-foodies dining out and tagged breakfast, brunch, Jackson Dodds, Melbourne, Preston, Reservoir, Thornbury on May 2, 2010 by gem. It seemed like a lovely idea to try and get breakfast or brunch not too far from where I lived after getting a blood test done. I hate the blasted things, and figured treats were in order. Thornbury or West Preston (there is division as to where this place is situated. Being pseudo-local to the area, I’d say Thornbury) is a few suburbs away from where I live and in the last few years is looking significantly…gentrified. Upon the recommendation of Eating Melbourne, I hit up Pearl Oyster which you can get to on the 112 tram (the one that goes up Collins and Brunswick Streets). 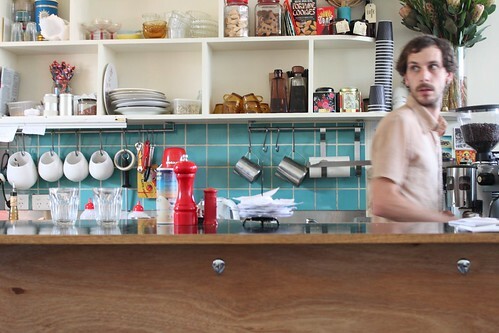 When I first walked it, it was a little intimidating – attractive hip looking young folks both as customers and as staff. 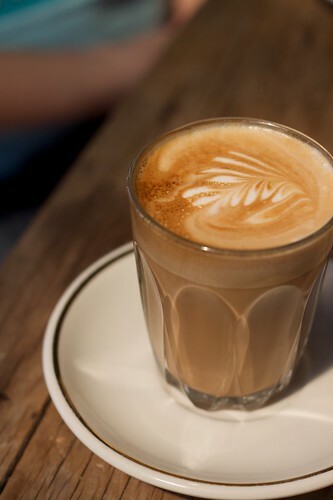 It has a really warm, friendly vibe and staff chat to each other like old friends. There’s lots of yummy choices, and they cater for vegetarians, vegans and gluten intolerant folks. 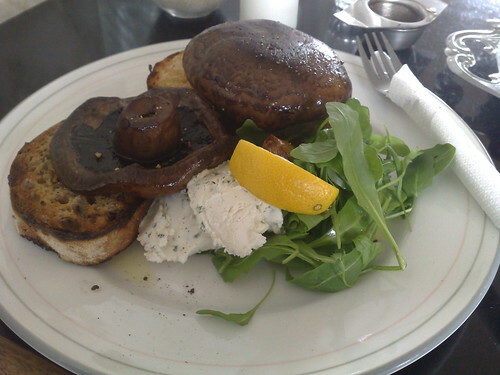 I agonised over the French toast, and the field mushrooms on toast with goats’ cheese as I waited for a fresh pot of Lapsang Souchong tea. I went with the savoury choice. 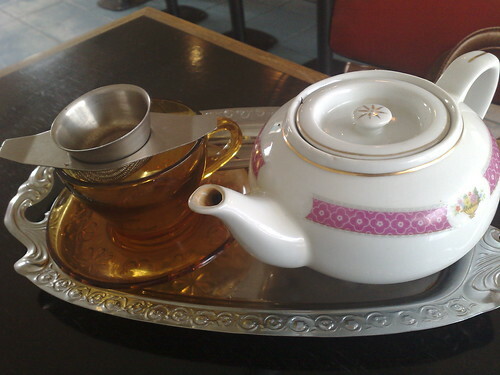 The tea service is a little mismatched, but I love the tray and the reused teensy old-school milk bottle. 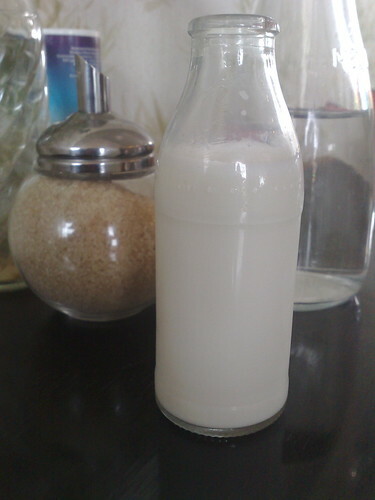 My lactose-intolerant body feels guilty at not finishing all the milk! Sometimes, I forget to ask for soy milk. I got stuck into my mushies and cheese pretty quickly – look how big they are! The sourdough was divine – one slice was plain, the other had olives in the loaf. While eating, the grocer arrived to deliver fresh produce and chat to the staff. It was all so idyllic. I returned a few days later with a partner. Service was erratic, but still friendly. We had coffee and eggs. In a classic manoeuvre of self-deception (no meat being healthier…don’t question my flawed logic! 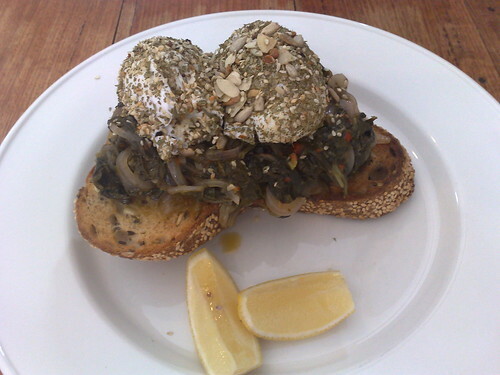 ), I chose the lean green eggs – dukkah poached eggs with spinach and a side of creamy labnah and hommus. I scoffed it down pretty quickly. Gosh, I do love homemade hommus. 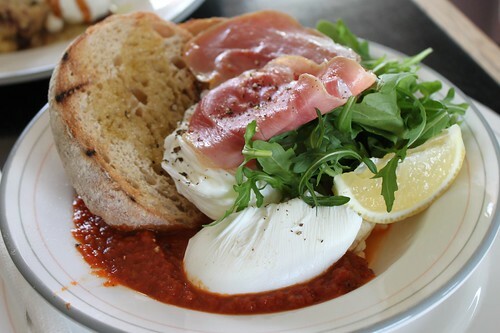 The SLR-wielding freak had the ‘bada bing’ eggs – poached eggs, prosciutto, spicy napoli and rocket. Rocking my street cred by taking good photos, harumph. Like a food magpie, I was lured by their adorable cakes and goodies at the front counter and left on both occasions with a chocolate muffin with silver cachous (which tasted every bit as delicious as it looked), and some other plummy unnameable thing as a treat for the bestie. 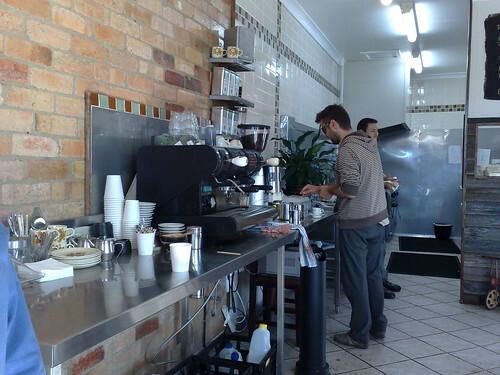 The cafe is deceptively large – both indoor and out. There is a lovely, spacious garden outside and a few tables on the pavement. If you’re in the area, you should definitely visit. It’s a very sleepy looking part of town that is either Thornbury or West Preston, as discussed at the beginning. Next time I’m too lazy to go into the city and its environs for decent brunch action, I shall remember Pearl Oyster is not too far a drive, and if game, I might try pushbiking out to it. Do take note that they only accept cash which may pose an inconvenience to some. 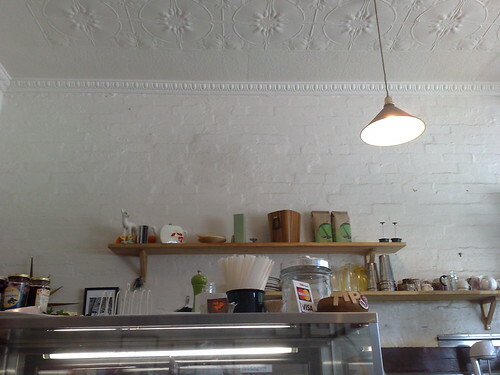 This entry was posted in eatie-foodies dining out and tagged breakfast, brunch, cash only, gluten-free options, Melbourne, Pearl Oyster, Preston, Thornbury, vegan, vegetarian restaurants on April 27, 2010 by gem.